What was most unusual about Marvel in the late 60s, 1969 particularly, is that the panels-per-page were decreasing dramatically. However, this only extended towards the more established artists, such as John Buscema on Captain America, John Romita on The Amazing Spider-Man, or Jack himself on The Mighty Thor. The wave of new artists that Marvel was employing in the late sixties - such as Herb Trimpe on The Incredible Hulk, George Tuska on The Invincible Iron Man or Neal Adams on X-Men - were still producing a great deal of content per page, often with their own unique, modern take on splitting panels. Whether this was a conscious attempt to stretch stories out and cut down on Stan's workload is unclear... after all, Stan was still writing The Incredible Hulk at this stage. When the Fantastic Four first launched, it had stories that sometimes even went up to 25 pages, and in comparing 1964's run to the run here, then 22 pages was the average. By 1965 a reduced 20 pages became the norm, though it wasn't until around 1968 that the huge reduction in panels became commonplace. In comparing that five-year period, then 1964 had 264 pages and 1593 panels of story, not counting that year's annual. By contrast, 1969 had just 240 pages and 973 panels. The '69 run looked much better, thanks to some terrific splash pages and the excellent work of Joe Sinnott, but in just five years readers were experiencing a 9% reduction in page count over the year, and over 38% reduction in panels. 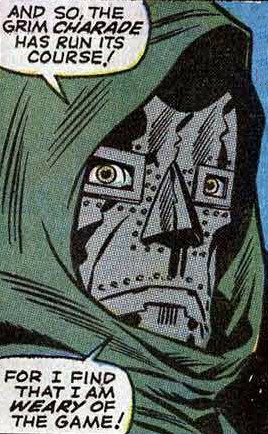 While some of the stories, in particular a perversely off-beat Doctor Doom tale, have quality, they're stretched out beyond their natural lifespan. Issue #91 featured a Soapbox from Stan, where he claimed that readers were split 50-50 over their liking of multi-part stories. Assuring readers that Marvel stories would from then on be single issue tales, the change was almost immediately felt; 1970 ended with a three and two-parter, but otherwise contained single issue stories. Not only that, but the panels-per-page increased by over 15%, indicating that the stories had been deliberately stretched out for commercial gain. 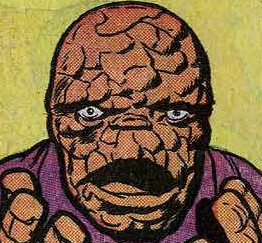 There's a decrease in genuine inspiration throughout the run, and although Jack Kirby is too good an artist - particularly with the inks of Joe Sinnott - to ever do anything less than spectacular, in terms of his own plotting it's clear his heart wasn't in it. While he was negotiating a move to DC Comics, and was preparing to launch his own titles, 1969 concluded with Ben taken to a Skrull planet full of "Magno-Men", flying saucers and a planet of 1920s gangsters. This final four-parter - which makes Kurrgo, Master of Planet X look like cutting edge literary SF - is so centred on Ben that the final four covers of the year feature the Thing and no other member of the Fantastic Four. With alien gangsters styling themselves after movie stars like Edward G. Robinson, it's a fun and engaging read, but is, by the standards of the book at the time, junk. No longer is the Fantastic Four a title that talks of the human condition, but one that has slid back into its earliest origins of pulp monster stories and alien invaders from outer space. 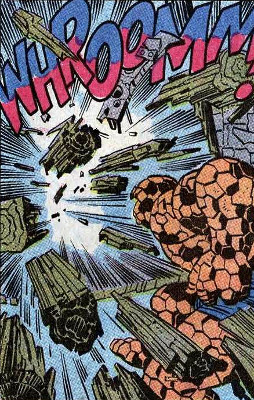 The most famous event of the year was, of course, the first landing on the Moon, an event which was a major step forward for mankind, but something of a problematical development for The Fantastic Four, a comic book which had based itself on fantasy travails based around the space race. Suddenly the group were no longer imaginary pioneers, but a team consigned to an alternative history. Thankfully they do at least manage to make a joke about this, with Skrull ships - looking like B-Movie ships from the 30s - commenting on how primitive a human space ship is. 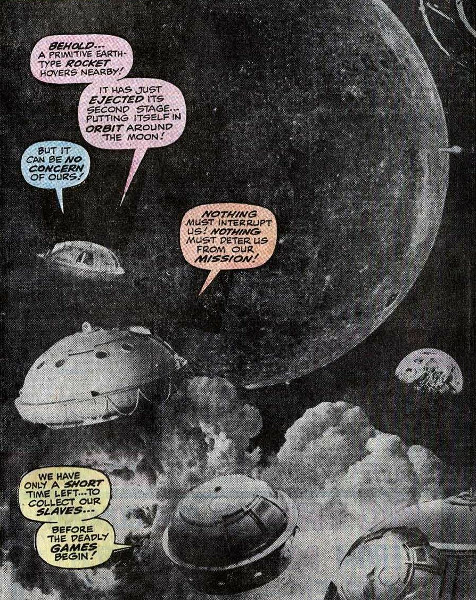 The actual Apollo landing was depicted in 1970's run, an event that altered the trajectory of the cosmic Fantastic Four. Read in the modern age, then the entire 60s run is frequently dated, of course, divorced from its original surroundings. Even the many sci-fi inventions that the title came up with - such as a "visi-phone" - have now become outdated by the age of Skype, something that wasn't an issue when the comic was originally published. One way in which the title kept up with reality was the group needing to pass through Soviet checkpoints in order to pass through to Latveria, a clear reference to the continued occupation of Czechoslovakia. Then there's Reed talking about it not being illegal to want to conquer the world, with Ben making the unusually prescient comment "Wait'll J.Edgar hears about that!" Although the title fails to do anything new, with four multiple-issue stories, all of which bring back old characters, the way in which it handles said characters is off-beat. There's the delightful perversity of the Mole Man creating a ray to turn the entire human race blind, even if Reed and Sue happening to buy his house on spec without so much as a mortgage settlement or several months of solicitors' search fees is incredibly contrived. The story is silly but likeable, though Johnny's lack of compassion towards the mental illness of the Mole Man is something that plays badly in the modern age. Ben's later discussion of whether they could torture the Mole Man to get information out of him is very topical in the modern age, and it's moments like this that got lost in the single-issue tales where space was more at a premium. Sadly for the Annuals, they entered a series of reprints for eight years across the entire Marvel line. 1969's Fantastic Four annual consisted of the very first issue and the second annual story, while the following years saw reprints of Annual #1 (#8, 1970), FF #43, Strange Tales #131 & Annual #3 (#9, 1971) and Annuals #3 & #4 (#10, 1973). The years 1972 and 1974-75 went without any form of Annual at all, and it was left to Roy Thomas to reinstate the idea of new stories for these specials in 1976. In terms of trivia, then look out for Reed having two left hands in the splash panel to Issue #88. Frank Giacoia inks the final issue of the year for reasons unspecified, and the colourist begins to experiment with mono colours for effect, most notably on the cover to Issue #87. Finally, Ben is able to knock down reinforced doors just by blowing on them... an event that the editorial team admitted was a creative "mistake" in the letters page of #91, and something more the province of Superman.